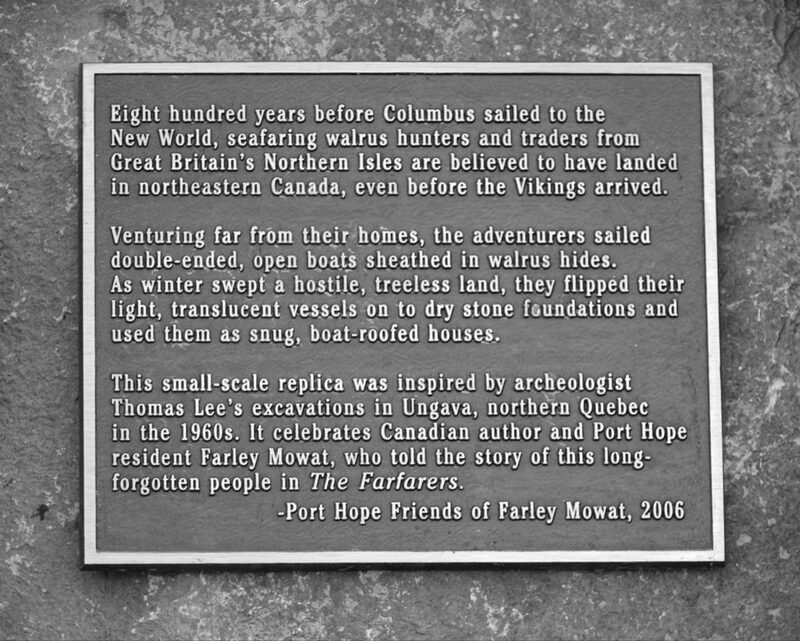 My hometown of Port Hope, Ontario has had a number of notable residents, among them Joseph Scriven (author of the hymn “What a Friend we have in Jesus”), artist David Blackwood, impresario and explorer William Leonard Hunt (the Great Farini), and author Farley Mowat, who died in 2014. I remember seeing Mowat around town, and everyone knew the story about him mooning the guests at a banquet, by means of illustrating that no underclothes were worn under a kilt. Now Chris Robert, a high school teacher of mine, sends me images of a monument constructed to honor Mowat and moved this past weekend to its current site on the east bank of the Ganaraska River. You can see Port Hope’s town hall in the background. I had never heard of this before, and I confess that the passive-voice construction “are believed” in the first paragraph made me suspicious (Wikipedians will automatically insert a superscripted [by whom?] whenever they find stuff like this). Moreover, there is a long tradition of imagining the arrival of pre-Columbian explorers to the Americas for various reasons – is this just the latest example? Who were these people, and what exactly did Thomas Lee discover on the Ungava Peninsula? I do not have a copy of The Farfarers to hand, although you can look inside the book at Amazon. According to the summary at Wikipedia, Mowat claims that even before the Vikings, settlers from the island of Orkney, chasing walrus ivory, reached Iceland, then Greenland, and then arctic Canada. Mowat calls these settlers Albans, after “Alba,” a Gaelic name for Scotland, and believes they were the descendants of the prehistoric inhabitants of the British Isles, pushed to the fringes by Celts and then Romans. 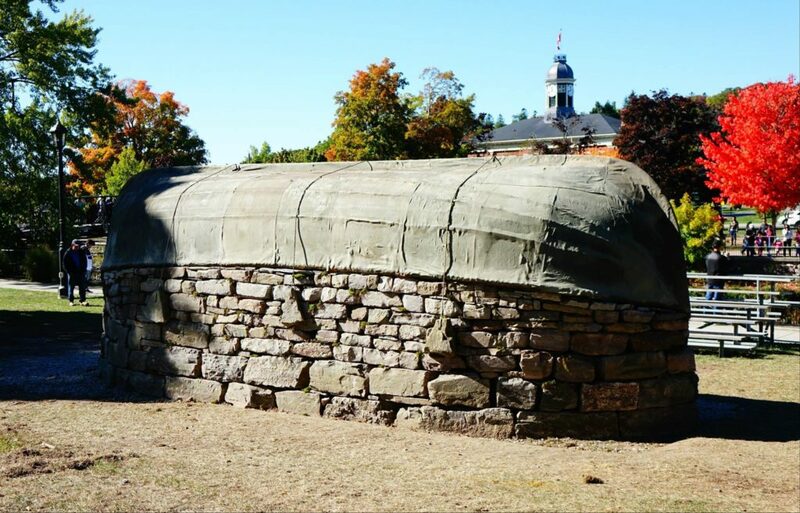 Thomas Lee was an archaeologist at Laval University; his excavations on the Ungava Peninsula uncovered stone building foundations that Lee thought were temporary shelters built by Vikings around the year 1000, the same time as their settlement of L’Anse aux Meadows in Newfoundland. Lee also found a stone landmark that he dubbed the Hammer of Thor on the assumption that it too was Viking, although it could simply have been an Inuit inukshuk. So it seems that Mowat was reinterpreting Lee’s data – Lee did not originate the theory of the Albans. Thus, it probably comes as no surprise that the editors of Canadian Geographic designated The Farfarers as “highly speculative” and noted that “no professional archeologists are known to share Mowat’s theories.” Stuart Brown of Memorial University noted the “small problem” of a complete lack of “reasonably compelling evidence,” with the book being “entertaining as fiction, [but] far from convincing as fact.” As much as I hate to run down a hometown hero, these assessments are probably accurate. Mowat did indeed have a reputation of never letting the facts ruin a good story. 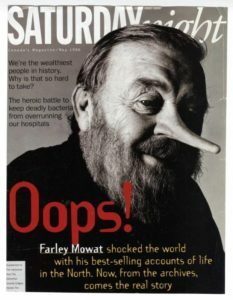 I recall a 1996 cover story in (the now sadly defunct) Saturday Night magazine, with Farley Mowat as Pinocchio. Reporter John Goddard investigated the research and composition of Mowat’s bestselling book Never Cry Wolf, and discovered quite a few things that he simply made up. As a historian, I confess that I cannot approve of this schtick…. When the ice opened for the last time, the local inhabitants urged the ships’ captains to get out before it returned and trapped the whalers against the northwest coast of Alaska for the deadly Arctic winter. It was September, late in the season, but the wind had always kept an escape channel open that time of year. Plus, the whaling was finally going well. The Yankee skippers decided to wait. It was a poor decision, which could have claimed hundreds of lives. On Wednesday, the National Oceanic and Atmospheric Administration said that it had discovered the wrecks of two of the 32 ships that were crushed by the ice that late summer of 1871 in one of the 19th century’s worst whaling disasters. More than 1,200 mariners and their families barely escaped in small whale boats through narrow and rapidly closing channels in the ice to reach rescue ships 130 kilometres away, according to NOAA and old newspaper reports. But the trapped whalers, many of which were owned by merchants of New Bedford, Massachusetts, were destroyed, ruining the owners financially and damaging the 19th century whaling industry, NOAA said. The loss of the ships equalled about $33 million in today’s dollars, Brad Barr, the project’s co-director, said Wednesday. The vessels, with names such as Concordia, Eugenia and Minerva, were left behind in the ice with their American flags flying upside down, a sign of distress, according to an old account in the New York Times. NOAA said the discoveries, near Wainwright, Alaska, were made possible, in part, because climate change had melted ice in the area and made wreck sites more accessible to archaeologists. Barr said that scientists had gone to the remote shores of the stormy Chukchi Sea, above the Arctic Circle, in August aboard a chartered research vessel. He said experts used state-of-the-art sensing techniques to locate underwater remains of the wooden ships, anchors and tell-tale implements carried by whaling ships of the 1800s. Among other items, the researchers found the iron braces, or “knees,” that supported the brick box in which the huge iron “try pots” boiled blubber into whale oil. The finds provided a fascinating glimpse into a forgotten era in seafaring history.